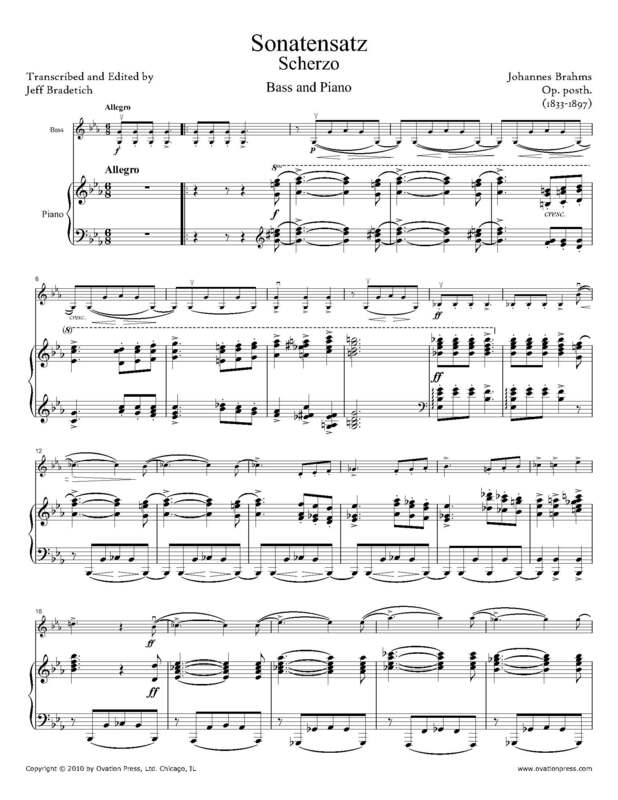 Please note: The piano part is available in both original and solo tuning. The Sonatensatz allows bassplayers to bring out the dramatic driving and singing qualities thatwere to become the hallmark of Brahms' music. As the third movement (Scherzo) of a collaborative work by Johannes Brahms, Albert Dietrich, and Robert Schumann, entitled the F-A-E Sonata, the Sonatensatz wasa surprise gift for the renowned violinist Joseph Joachim. Joachim’smotto “Frei Aber Einsam” (Free but Lonely) served as the inspirationfor the title "F-A-E" rather than the keys. Dietrich composed the firstmovement Allegro. Schumann provided an Intermezzo for the secondmovement, as well as the Finale. Brahms' Scherzo movement took on alife of its own outside of the sonata thanks to Joachim. Although thepremiere was given in 1853, the work was only published posthumously in1906 and was originally written for Violin. Double bass players in general love the music of Brahms and often perform the 1st movement of the e minor cello sonata successfully. The Sonatensatz allows bass players to bring out the dramatic driving and singing qualities that were to become the hallmark of Brahms' music. Check out the video below where Jeff Bradetich shares his thoughts on this work. You can also preview a recording of Bradetich playing this piece.